This is a rectangular Paint That Lasts porcelain sign. This particular Paint That Lasts sign is predominantly green and red with white text. 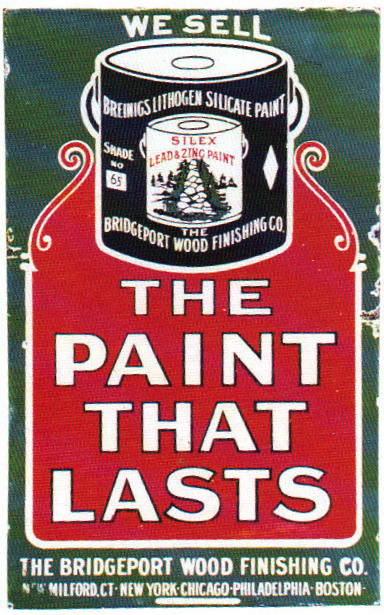 It reads, “We Sell The Paint That Lasts, Breinigs Lithogen Silicate Paint, Shade No 65, The Bridgeport Wood Finishing Co., The Bridgeport Wood Finishing Co., Milford, CT, New York, Chicago, Philadelphia, Boston” and features a black paint can at the top of the sign.